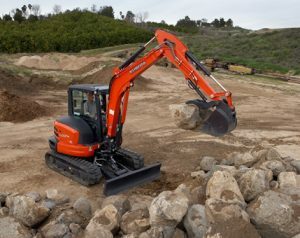 You buy a Kubota Excavator to get more done, and it’s our job to keep you going. That’s why when you purchase any new Kubota Compact Excavator with Coleman Advantage, we will back you up with a Coleman Equipment Exclusive 5-Year Limited Powertrain Warranty*. This is the best value on a Kubota Excavator anywhere in or near the Greater Kansas City Area. This is a limited time offer, so come by or contact your sales representative today. *The Coleman Equipment Limited 5-Year Powertrain Warranty is only available to customers who purchase Coleman Advantage at the time of purchase. All maintenance and repairs must be performed according to the Kubota operator’s manual and using only Kubota Genuine Parts. Call for full details and restrictions.